Actor/activist shares his family's incarceration story, criticizes president's policies at a series of events in Downtown Los Angeles. Warnings of the possible effects government overreach are nothing new in American society, but when the cautions come from one who has lived through an unfathomable injustice, the words have immeasurable weight. Actor and activist George Takei on Feb. 13 took the lead in a ceremony at the Los Angeles City Hall rotunda, during which more than 300,000 petition signatures were handed to officials from the Muslim Public Affairs Council. The petitions are meant as a show of solidarity with the Muslim community, in the face of what Takei sees as a repeat of the fear, racism and scapegoating that led to the World War II imprisonment of some 120,000 innocent Japanese Americans, including himself and his family. Takei was joined by dignitaries including Mayor Eric Garcetti in denouncing the executive order signed last month by President Donald Trump that bars entry to the U.S. for citizens of seven predominantly Muslim nations. Takei established the petition via Care2, an online activist community, with the goal of gathering 320,000 supporters. He said more than 319,000 had signed as of that evening. The Muslim Public Affairs Council plans to deliver the signatures to officials in Washington. The mayor said scores of those fleeing the Nazis were stopped at American shores and sent back to their deaths, something he vowed would not happen again in the current climate. “Not on our watch, and not on the watch of the 300,000 Americans who signed this petition,” asserted Garcetti, whose grandfather came to the U.S. as an undocumented immigrant and later fought for America in World War II. “We will combat all forms of extremism, and we will oppose any and all efforts by the Trump Administration to establish extremist programs,” Garcetti added. Takei, 79, recalled being removed from his boyhood home by U.S. soldiers armed with bayonets, and how even kids were followed by searchlights on their nighttime trips to the camp latrine. His remarks came of the eve of the 75th anniversary of Executive Order 9066, the 1942 directive from President Franklin D. Roosevelt that cleared the way for the roundup and incarceration of persons of Japanese ancestry, most of whom were American citizens. “I will remember Feb. 19, and we will all remember to say, ‘Never again,'” said Takei, noting the signing date of EO 9066. 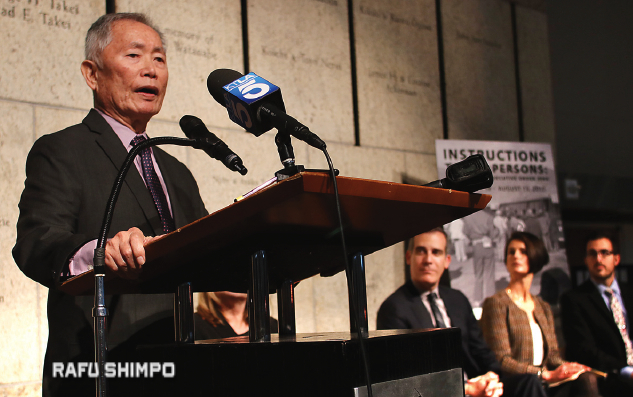 Takei and Garcetti also spoke on Feb. 17 at a preview of the Japanese American National Museum’s exhibition “Instructions to All Persons: Reflections on Executive Order 9066,” which features the original document signed by Roosevelt.